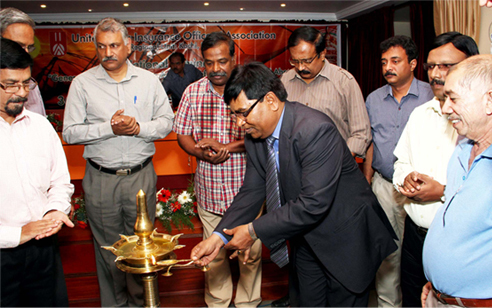 Kochi, February 16, 2014: The 36th Annual General Body of United India Insurance Officers’ Association concluded today in Kochi at Hotel Riviera Suites, Thevara. The meeting was attended by more than 200 delegates from across the country. Addressing the delegates, Mr. Milind Kharat, Chairman and Managing Director, United India Insurance Company, said the general insurance industry is in its growth path and the premium is expected to touch Rs. 1 Lakh Cr by 2015. “Company is expanding its distribution channels and recruiting more agents to reach out to the rural masses. More offices are being opened in rural areas. Company is also focusing on improving customer service,” Mr. Kharat said. Mr. Kharat also revealed that more recruitments are on the way. Talks on salary and other employee benefits are also progressing. The meeting was presided over by Mr. C. A. Bhaskaran, All India President of the Association. Mr. Jose Varghese, President CONFED; Mr. V. Mohankumar, General Secretary, UIIOA; Mr. V. Sajan and Mr. K. B. Vijaysrinivas, DGM’s, United India Insurance also addressed the delegates.